Our Queen houseboat is the most elite in our fleet and certainly a favorite among our guests. The Queen has a master penthouse suite on the 2nd deck, along with a private bathroom. 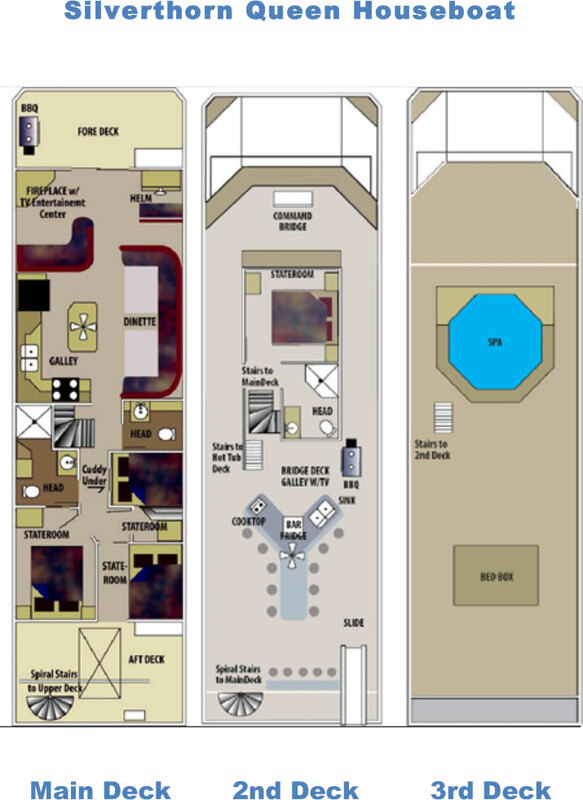 On the main deck, there are four private staterooms as well as extra sleeping areas in the main living area. This houseboat boasts luxurious amenities while accommodating a large group. The houseboat also has two and a half bathrooms and a spacious kitchen with a 25 cubic foot refrigerator/freezer. There’s also a wet bar on the 2nd deck that is equipped with sinks, a refrigerator and a cooktop in addition to the BBQ grill so you can still be part of the fun without being cooped up in the kitchen. The Queen houseboat combines space and luxury with a large hot tub on the 3rd deck, a sun deck for lounging and a water slide for more exciting play in the water. For fun out of the sun, the interior of this houseboat is furnished with a fireplace, flat screen TV with DirectTV and DVD player for those relaxing nights in.